That quote really resonates with us. This season of life has been challenging, with more stress on Curtis and more time apart than ever before. We know that through trials we develop stronger faith and grow closer to God and each other. I don’t want to sound ungrateful because this job has given us so many wonderful opportunities we wouldn’t have had otherwise, and overall we are very thankful, but obviously there are harder times that we have to endure. On top of that, we feel like we’ve spent too many weekends cooped up at home because of frigid temperatures and snow storms, and that’s really cramping our style. You’ve probably figured that out by now based solely on the lack of blog posts! Again, it’s what we signed up for, and while we have enjoyed most of our experience here, there comes a point where we’re ready for a change; ready for the next season. We’re tired and mentally feel stuck in a place we don’t enjoy. But every five weeks, Curtis’ intense schedule gives us a 4 day weekend, and just getting away from reality for those days makes everything better. Our minds are renewed and opened to new experiences, and we return home refreshed and ready to take on another month. The weather hasn’t always been favorable for these trips (the first one we hiked in single digit temperatures, the second we drove home through a snowstorm) but we have never regretted taking these opportunities to travel together. In the end, we are thrown back into the seemingly endless cycle of shift work, but the new memories we made together makes the challenges a little easier. We started by driving 3 ½ hours to Scranton, PA on Thursday night to break up the drive. Yes, that’s the Scranton from “The Office”. We didn’t do any sightseeing here, but if we ever get the chance to go back, we’re definitely eating at the Chili’s. 😉 The next morning, we drove the remaining 3 hours to our first attraction: Gettysburg National Battlefield! When we first arrived, we were a little disappointed to find a huge parking lot packed with cars. It was a weekday morning in the winter, for crying out loud! Curtis went in to the visitor’s center to get some information. The part that annoyed him the most was that when he talked to 2 different rangers, he told them that we love hiking and specifically asked if we could do that here, and they both only tried to sell us on their audio tour. However, one look at the park map shows that there are several trails, one that goes around the whole Southern part of the park. There was still a good amount of snow all around from Winter Storm Stella, but we had our snowshoes with us and were eager to do some hiking in over 30º weather! Also, we were very thankful that this historic site (as well as all the others we had planned for the weekend) was puppy friendly, so Charlotte got to explore everywhere with us! In case you’re familiar with the area, we walked South along West Confederate Avenue (along the Confederate Line), sometimes breaking away from the road to walk the trails. When we came to Big Round Top, we took the trail that goes around the peak and up to Little Round Top. (There is a spur trail that goes to Big Round Top, but there didn’t appear to be much of a view so we decided to forgo it on today’s hike.) We then headed North (along the Union Line) to about the Plum Run area crossed the battlefield, and made our way back to our car on Seminary Ridge. In all, we probably walked 8 miles around the whole area, which was honestly pretty easy walking with not a lot of elevation change. In all we were here for 5 hours. Our favorite parts of the walk were the more detailed, unique, and expressive monuments, and the views from Little Round Top. Curtis was especially impressed by the depth of knowledge and information you can read about on the plaques (which are EVERYWHERE) — down to each brigade, and the numbers of the dead and wounded. We just hadn’t gotten that much information from walking around other historic battlefields. Curtis: I could write a whole lot on the battle: the events leading up to it, the course of the battle, and the aftermath, but I won’t. Solely because I believe that this (and many other civil war sites across the country) is possibly one of the most understood and preserved military battles in the world. Unlike European battlefields, or many American colonial sites, immediately following the War, societies on both sides of the Mason-Dixon line sprang up and began forming monuments and preserving the land that so many had died for. In some cases, such as Gettysburg and Antietam, the land was turned over to the Federal Government and a body of veterans with an equivocal desire to preserve the land, but also to inform. As early as 1895, the War Department and veterans of both sides set about marking the lines of battle. This takes the form of hundreds of black placards around the park giving detailed information of not only each Corps, but of each division, brigade, battalion and battery and what they did each day. Compare this to contemporary battles of the Civil War like Balaclava and the Charge of the Light Brigade in the Crimea where all there is to mark the land are a few monuments. Even today, the Civil War Trust still seeks to preserve the Nations History, including the preservation of Morris Island. FYI: Also in the area is Dwight D. Eisenhower’s homestead — we didn’t visit it today because the only way to visit is by taking a shuttle from the Gettysburg visitor center. You get a great view of it near the Observation Tower on West Confederate Ave. though. One other nearby attraction is a beautiful covered bridge off of Waterworks Road just minutes outside the battlefield. After we finished up our walk, we drove around the battlefield for a letterbox we hadn’t stopped to find earlier, and it was shocking how quickly we covered the exact route we had walked. 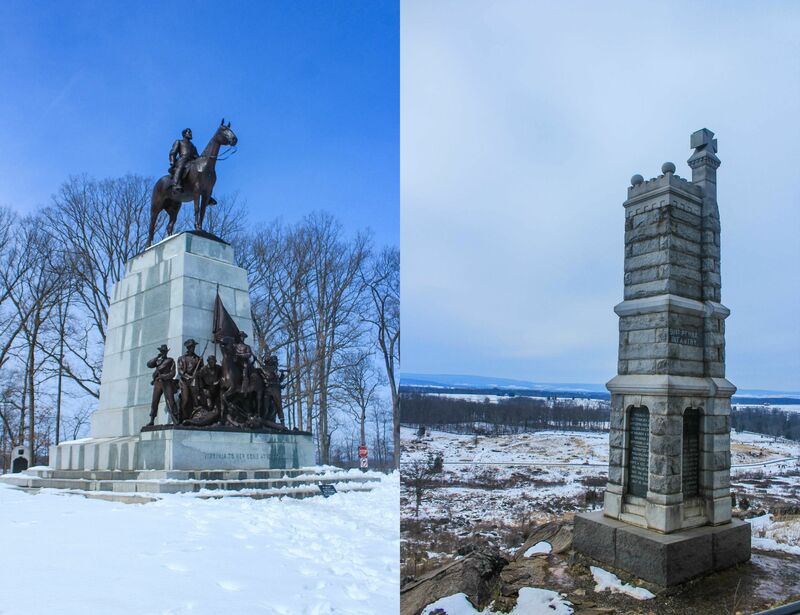 Originally, I had thought we could visit both Gettysburg AND Antietam in the first day, but I’m glad we didn’t — it was worth taking the time to explore both more in depth. We had only 3 days to explore the area around the Mason-Dixon Line; we could have easily spent a week here with all the hiking and history there is in the area. We watched the sun set as we drove another hour South to our hotel in Maryland. I think we already knew at this point that this was going to be one of our favorite getaways.